Below are some of the most frequently asked questions regarding the Optomap, along with answers. Q: Describe what the Optomap is used for and give a basic sense of how it works. A: The Optomap is advanced screening technology that is used to evaluate the health of the retina. The Optomap takes a wide-angle digital image of the retina which often eliminates the need to dilate the pupils. It is used for early detection of eye disease such as macular degeneration, glaucoma, diabetes, high blood pressure, etc. Annual eye exams that include looking at the retina are very important to maintaining vision and overall eye health. It becomes a permanent part of a patient’s record and the images can be compared from year to year to watch for any changes. Q: What components, or how much, of the retina does this look at and give imaging for? 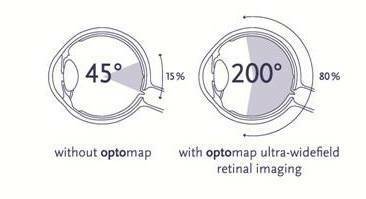 A: The Optomap ultra-wide digital imaging system captures more than 80% of the retina in one panoramic image. Traditional methods typically reveal only 10-12% of the retina at one time. It allows us to see far out into the periphery of the retina, we see the retinal blood vessels, the optic nerve, and the macula. Q What types of eye diseases and disorders can be discovered? A: The Optomap is used for early detection of eye disease such as macular degeneration, glaucoma, diabetes, high blood pressure, tumors, etc. Q: What is it about this particular technology that you find most exciting; the component that made you feel you need to invest in this for your practice? A: The Optomap has the advantage of getting a view of almost the entire retina all at once without dilating the pupils. It also allows us to permanently document the status of the health of the retina and optic nerve for future reference. When a patient returns for his annual eye exam each year, we take another image, compare that to the image from the previous year and easily see any changes that have occurred. Q: Can you describe the patient experience when using the Optomap? A: The patient positions themselves in front of the machine and looks inside at a target. The technician adjusts the patient’s head position as needed to get a good image, clicks a button to take the image, repeats the process for the other eye, and that’s it! It literally takes approximately two or three minutes. Much less than the 30 minutes needed to dilate the pupils. A: Absolutely! We use the latest technology throughout the office. The Optomap is just one example. Patients love not having to be dilated, they like being able to see the health of their own eyes, and they understand the value of the side-by-side comparison of their retinal images from year to year. Q: How does this technology improve comprehensive eye exams compared to the days when we did not have Optomap Retinal Imaging? A: The Optomap has the advantage of getting a view of almost the entire retina all at once without dilating he pupils. It also allows us to permanently document the status of the health of the retina and optic nerve for future reference. When I see a patient with a “normal” retina I would document in the record just that, “retinal normal”. But comparing the images from year to year lets me see changes that might be occurring, and change often times indicates a problem. We are much more likely to catch any problems at an early stage this way. Q: To what patients do you recommend using the Optomap? A: I recommend the Optomap as a screening evaluation of the retina during all annual eye exams. I also recommend additional high-resolution images or stereo images for patients with glaucoma, macular degeneration, diabetic retinopathy, hypertensive retinopathy, tears or holes in the retina, etc. Q: Are there certain feelings or vision issues that a person may notice that would point to the need for Retinal Imaging? A: Unfortunately, no. Many eye diseases are asymptomatic in the early stages. That is why an annual evaluation of the retina is so important.